If you have been seriously injured because a property owner failed to maintain his or her premises properly, you need representation by a qualified premises liability attorney. How Do We Help in a Slip and Fall Injury Case? When you retain our firm, we will investigate your case to establish the parties that may be held liable for your injuries and will work to build the strongest possible case for you. Slip and fall accidents are important safety hazards that cause injury and death to hundreds of Miami residents every year; adults age 65 and older are particularly at risk. According to The Florida Department of Health (DOH), falls are the leading cause of injury death for Florida’s senior citizens and the second leading cause of injury-related death for Florida residents. Falls are also the leading cause of non-fatal injury-related hospital admissions. 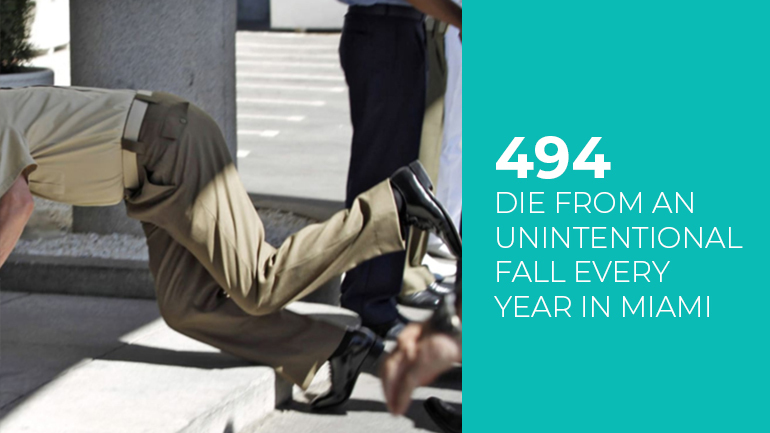 During the course of one year, 2,7K Floridians died from an unintentional fall and there were 67,8K hospitalizations for fall-related injuries. A statistic for one period for Miami reports 494 deaths from falls and 23,2K non-fatal fall injury hospitalizations. Where Do Miami-Dade County Residents Suffer Slip and Fall Accidents? What you need to know about the terms Slip, Trip, and Fall, is that they relate to situations where an individual suffers some personal injury on the property or premises of another individual, company, or business. Health care costs as a result of preventable falls among seniors alone are $30 billion each year. This does not even account for the multiple other costs associated with these accidents. A slip and fall accident can happen anywhere an individual is walking, jogging or running. This could be in department stores, grocery stores, in condominiums, on the city sidewalk, through a drugstore parking lot, or while going down the stairs in a shopping mall. Steps, staircases, and ramps are practically everywhere in Miami, and many do not have the strips that are required under the code. According to Florida premises liability law, property owners, landlords and those responsible for private or public establishments, are legally liable for slip, trip, or falls resulting in serious injury in Miami brought on by improper maintenance, operating conditions, or unsafe standards. While each person is responsible for being aware and conscientious of safety hazards, property owners are also required to ensure the safety of guests by maintaining their premises. The property owner or responsible party may be legally liable to cover any, if not all, medical costs and lost wages. Florida law dictates that you may present a slip and fall claim within four years of the accident. In all slip & fall cases in Miami, The Law Offices of Sean M. Cleary's personal injury attorney will prove legitimate compensation claims to reveal that you were unaware of any possible risk of injury on the premises where the accident occurred. Furthermore, the personal injury attorney must prove that the property owner was aware of the possible risk of injury to others but never attended to the risk in a set period. You must take into account that specific rules and regulations apply when personal injury occurs on federal, local, or state property. Slip and fall claims against a city, county, or the Florida state government must be filed within three years of the accident. In addition to the shorter time limit to submit a claim, there are also special rules you need to follow, and there is a limit to the amount of damages you can receive. In Florida, you are allowed to receive only $200K per person and $300K per tort claim. Premises liability injuries are not limited to slip-and-fall accidents that are caused by stairways or uneven or slippery surfaces. An owner’s violation of safety rules also might entitle you to receive compensation for other injuries, including those caused by falling objects, swimming pools, accidents at theme parks and carnivals, and assaults caused by a property owner’s failure to provide adequate security. Needless to say, hip fractures are prevalent and a very serious injury. Hip fractures are not only the most common type of non-fatal injury but also account for one-fourth of all fatal injuries in the state of Florida. Treatment for hip repairs often involves major surgery and lengthy rehabilitation. We recently represented a man who slipped because there was water on the floor of the hotel he was staying at. As a result, he needed a brace and crutches and had to immediately fly back home and have surgery. Also, through thorough investigation, we were able to help a woman who fell in the grocery store on a slippery surface because the store failed to warn customers of the danger adequately. Our client seriously injured her head and back. For more information or a free consultation on any incident involving serious bodily harm or death on commercial or residential property in Florida, please call us at 305.416.9805. How Do We Handle a Slip and Fall Accident Case? How Can the Law Offices of Sean M. Cleary Help You in a Slip and Fall Accident Case? If you or someone you love has suffered a catastrophic injury because a property owner failed to maintain their premises and take adequate safety measures, you may be entitled to compensation. By bringing a personal injury claim against the responsible parties, you may secure compensation for medical expenses, time off work, lost wages, and physical and emotional suffering. Slip and fall cases can become complicated very quickly, often involving multiple parties with multiple insurance carriers. When you retain our firm, our lawyer will carefully investigate your case to identify all parties who may be held liable for your injuries and work to build the strongest possible case on your behalf. Our lawyer knows what it takes to negotiate a fair settlement in a premises liability claim, and he will try your case before a judge or jury when an appropriate settlement cannot be achieved. Contact the Miami slip and fall lawyer from The Law Offices of Sean M. Cleary today to discuss your legal options. Call 305.416.9805 to schedule a free case evaluation. If the insurance company of a Miami shopping center where you slipped and fell asks for your statement you must not give them one. It is crucial never to give statements to insurance companies without an attorney advising you. Insurance companies will attempt to maximize your fault and minimize that of the business where the incident occurred, to pay no compensation or the minimum compensation required. With the help of an attorney, you can receive fair compensation. In order to win a slip and fall settlement, you need to prove that the owner of the property where the incident happened is guilty of creating the dangerous condition that led to the incident, of being aware of the situation, and of failing to act upon this knowledge, thus creating favorable conditions for your injuries to happen.